Medieval artillery has been a subject of fascination since the nineteenth century. The interest is shared by film-makers, hobbyists, teachers of physics, archaeologists and the occasional historian. Not all have applied a rigorous approach to the evidence and frequently the result has been a fantasy. Too often, even professionals have reproduced without further examination the unproven hypotheses that haunt the subject: Michael Fulton’s new book will give no one any excuse to get it wrong in future. Fulton studies the use of artillery between 1097 and 1291 in the Middle East combining archaeological evidence with critical examination of the historical sources. Denied access to many key sites by war in Syria, he has benefited from the knowledge of experts who have worked there, such as Denys Pringle, and has additionally called upon mathematical skills such as those of Mark Denny. The application of modern science to understanding the practicalities of medieval artillery is far from new, but Fulton uses it with the other evidence to test the hypotheses against real scenes of conflict. His conclusions are stark and overturn many widely accepted assumptions: the ‘hybrid trebuchet’ now cited by many historians did not exist, the counterweight trebuchet appeared only at the end of the twelfth century, the thickening of walls has been exaggerated and in any case was not because of the growing impact of artillery, and even the biggest counterweight engines could not breach stone walls. Does he prove these conclusions? Those of us who have reserved the word ‘trebuchet’ for the time when it actually appeared (the last decade of the twelfth century) confront in frustration the fact of its routine application to the manually-driven stone thrower (developed in imperial China and first used in the western world around 600) under the invented modern term ‘traction trebuchet’. 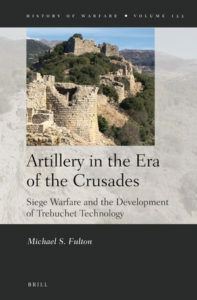 Fulton likewise uses the term for all such artillery from late antiquity (the chapter on the background accepts the view now shared by many scholars that the torsion-powered onager did not continue into medieval times). There is also little new in his analysis of how it worked, the limits on its size, range and power and his appreciation therefore that it was an engine that could be made quickly and easily and operated by small teams of rope pullers, and in skilled hands it was capable of a great rate of shooting, but only of small missiles. Its impact in sieges was as an anti-personnel weapon, and its effect was both physical, and psychological. The latter point is important: unfortunately the evidence for the consequences of being subjected to a continuous hail of stone shot that killed or maimed, day and night – as at Lisbon in 1147 and numerous other sieges – does not exist, although modern psychological studies might be read back. Fulton’s confirmation of the sheer number of stones that could be projected over or at a town or fortress wall using the evidence recovered from excavations, is powerful. Over the many centuries of its employment, did the ‘traction trebuchet’ (it was usually called by a variant of the words mangonel or petrary or Arabic equivalents) evolve? Fulton examines the many variations that were possible as shown in medieval illustrations, and sometimes in surviving treatises, but he is right to conclude that there were practical limits caused by the fact that it relied on a group of people (men or women) pulling down a lever arm so that the longer end swung into the air and released its missile from a sling, and that there are mechanical limits to its size, which he demonstrates well. Paul Chevedden was responsible for inventing a ‘hybrid trebuchet’ which allegedly added a counterweight to the short arm to increase the power and thereby explain the references in some chronicles to wondrous new weapons. Fulton has already published on the mechanical improbability of such an engine and here repeats his conclusion (shared by this reviewer) that it did not exist. He argues that the mechanics of the counterweight trebuchet were simple and could readily be scaled up. He rejects the notion its invention can be dated to any of the earlier references to ‘new’ engines (as Chevedden had argued) and proposes its appearance in the last two decades of the twelfth century. His analysis of the many sieges in the region shows no change in the supporting role of artillery at this time: it was used both defensively and offensively, and if the latter was aimed at defenders rather than defences. It worked in combination with attacks by siege tower and, time and again, by sappers and miners. He claims that the increasing references in Muslim texts “speaks to the growing importance of these machines or a widening perception of this” (149). He argues for the presence of counterweight engines in the third crusade and that they had “almost certainly developed into practical and effective weapons, but were still far from the behemoths that would be built in later decades” (151). The first known illustration of the counterweight engine remains the drawing in the treatise of the Egyptian al-Tarsūsī. Fulton dates it to 1180, it certainly precedes the death of Saladin (1193) to whom it was dedicated. But he acknowledges “the immaturity of the design is clear” (434), unlike the other engines he drew. The advantages of the new design were its greater accuracy (it could always hit the same spot) and – only potentially at the beginning – its ability to hurl much larger stones. If it did appear during the third crusade, and if its advantages were so clear, one might wonder why there is no reference to it in later campaigns in Europe of Richard I and Philip Augustus, and why it only appears in England with Prince Louis during the civil war after Magna Carta. There are alternative explanations for all these events and in the absence of conclusive evidence, this debate will continue! There is agreement that the counterweight engine was quickly adopted and also was quickly scaled up so that artillery of unprecedented scale and power was in use during the thirteenth century. Fulton analyses the sieges of this period in great detail, the number of engines deployed, the large number of smaller engines alongside the occasional monster – and argues that in every case where a fortress was taken, it was by other means – again, most often, mining. He challenges arguments by many historians that counterweight trebuchets demolished walls by reviewing what actually happened. He takes account of the overall context – generally, that the armies of the Ayyubids and especially the Mamluks enjoyed great numerical superiority and particularly during the final decades there was little prospect of crusader fortresses being relieved. Fulton then takes aim at the explanation supported by many historians that walls and towers were strengthened against (or to mount) counterweight artillery. His conclusion after reviewing many castles strengthened between the twelfth and thirteenth centuries is that “there was no revolution in fortress design, walls were not uniformly thickened and solid towers remained rare” (347). He points out the probably symbolic role of much construction while not forgetting their defensive purpose, but explains this as the need to provide more platforms for archers and crossbowmen. Similarly, many of the enormous towers created under the Mamluks were designed with large spaces inside for comfort or display or spacious fighting platforms. Having seen many of the sites Fulton analyses, this reviewer agrees. The books ends with several valuable appendices, listing and analysing contemporary manuscript images, and reproducing Mark Denny’s mathematical calculations for various sizes of engine, which can be compared helpfully with the data from a number of modern reconstructions. His analysis of the images would have been easier to follow if they had been reproduced but this would have been very expensive so was not attempted. Sometimes he appears to misunderstand the purpose of the original artist: medieval manuscript drawings were not meant to be scale drawings, and they are ‘skewed’ because they did not have perspective – only in renaissance times (with the exception of the early thirteenth century Villard de Honnecourt’s notebook) were (some of them) meant to inform an engineer what to do! Does Fulton deliver on his objectives? Largely, yes. But even this large book (sadly probably too expensive for many who would be interested in it) does not solve all the problems. On one of his central theses, he wavers. The largest engines did not just not break walls, only demolishing wall tops (battlements) – an important role – but also “threaten[ed] the much thicker walls below” (4 and compare 404). While it is reasonable to conclude that the largest weapons were built (at great expense and time) to demonstrate the power of their owner, with the pay and rewards of their engineers (increasingly named in sources) reflecting the same, the thought that a bombardment of carefully carved stones weighing more than 100 kilograms would have no serious physical impact on the target remains questionable. This valuable work, although not resolving all the debates, is likely to be a standard reference for all future students of medieval warfare – and should be consulted as well by those whose primary study is the archaeology and architecture of medieval castles and cities.